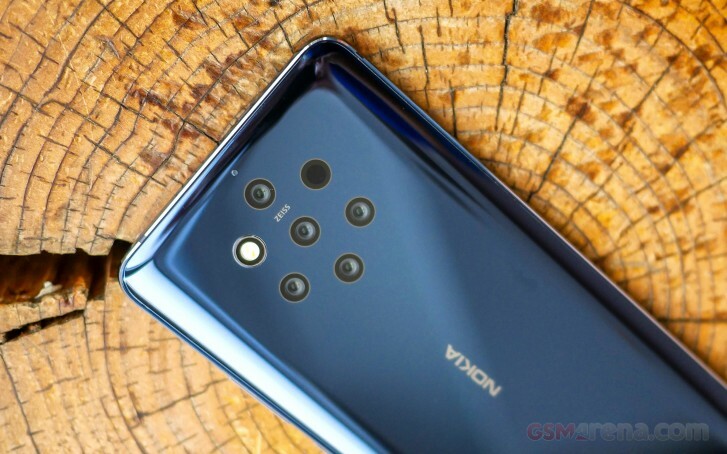 When we first got wind of the Nokia 9 PureView and its multi-camera system, we were sure Nokia had hopped on the ultra-wide-regular-telephoto bandwagon with a time of flight 3D and monochrome auxiliary cameras to fill the quota up to five. We were wrong. Nokia surprised just about everyone with the camera selection on the Nokia 9 PureView - five 28mm 12MP f/1.8 snappers, three of which are black and white, two of which are RGB, and a TOF 3D camera on the side. So what do five cameras with identical fields of view do for the one clicking the shutter button? Nokia has gone for a few inherent advantages of the 9 PureView camera system - great dynamic range thanks to the combination of three monochrome cameras and two color ones, native black and white photography, flexible RAW DNG files to extract the most of the sensors through Lightroom on the phone and superior scene depth mapping with refocusing possible after the shot. We think the biggest leap forward might actually be in the quality of the scene depth mapping. You see, having five cameras with different vantage points aimed at the same scene gives the Nokia 9 PureView a highly accurate depth map of said scene. It's not only the resolution of the depth map - there's plenty of phones with high-res imagers. The key is in the levels of depth that can be recognized - Nokia says that while most phones can recognize up to around 10-15 focal planes, the Nokia 9 PureView captures up to 1,200 and through AI extrapolates those into infinite numbers of layers. This leads to two advantages - the ability to create photos with a realistic defocus effect and the ability to snap a shot and choose a different focus point later (so if you've missed focusing on a person's face it could be fixed, potentially). Now let's put the Nokia 9 PureView's theoretical abilities to practice. You can see in the image below that compared to the iPhone XS, the Nokia 9 PureView has created a more accurate depth map with improved subject separation from the background. 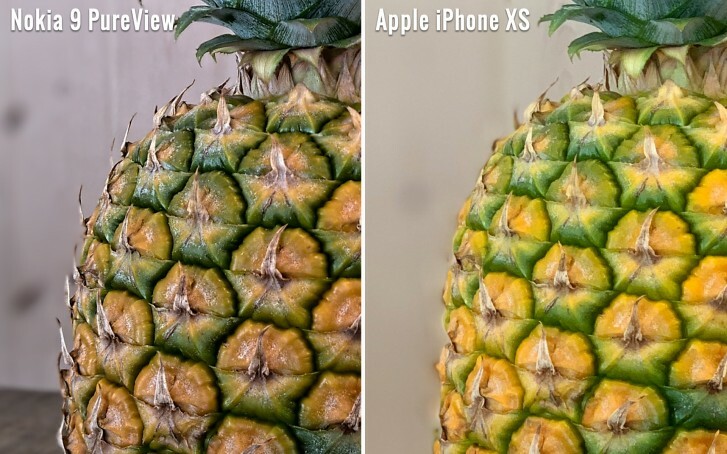 The pointy pines of the pineapple have been blurred out by the iPhone but are preserved on the Nokia image. 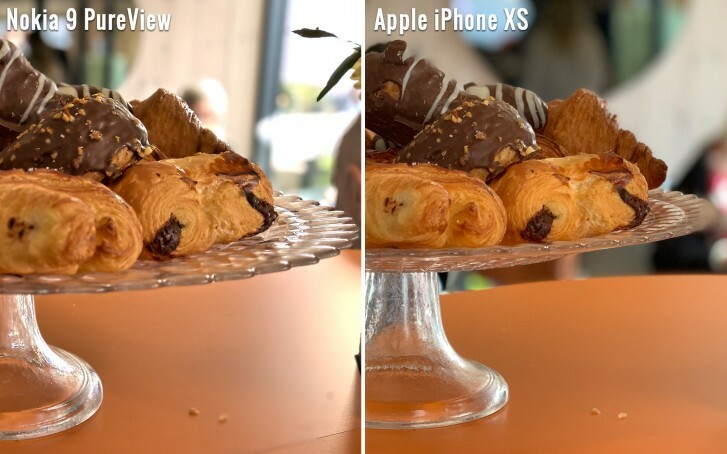 This second example stands to show something else - whereas the iPhone was mostly able to separate the plate of croissants from the background, it has blurred out bits of the subject it couldn't correctly place in the focal plane. The Nokia 9 PureView has read the scene more accurately and has produced a gradual blur with more accurate falloff. The Nokia 9 PureView's shot looks as if taken with a proper camera with a proper lens. The glass plate is blurred in the foreground and background with focus in the middle. In the iPhone image the plate and croissants are both in focus and look as if stamped onto a simulated blur layer. Both phones produce a depth map and apply software blur to the out of focus areas but the Nokia 9 PureView clearly has a more detailed and accurate depth map. 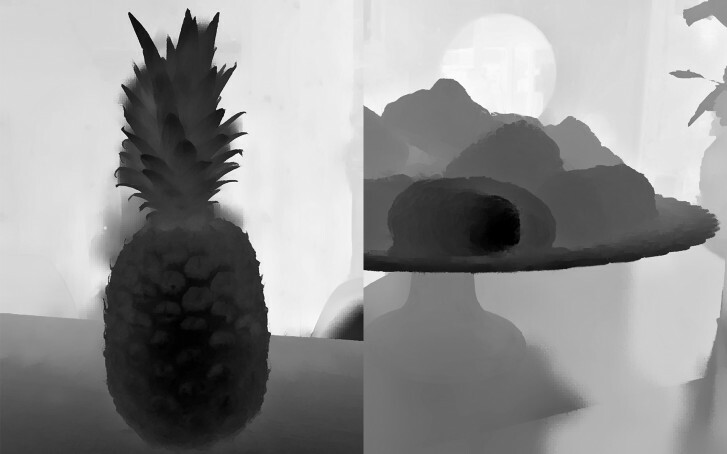 What's curious, you can actually extract the depth map from each image. Here's what the depth map for the images above looks like. And here's a 3D simulation of a photo taken with all five of the Nokia 9 PureView's cameras we created through Depthy. Most phones will be able to capture a horizontal plane of a scene by using multiple cameras but the Nokia 9 PureView's array allows for both horizontal and vertical information to be captured. Using this 3D plane the Nokia 9 PureView can map a very accurate focal plane. Keep in mind that most phones do a much better job when simulating potrait mode shots of human faces. There the Nokia 9 PureView won't offer as big an advantage over phones like the iPhone XS or the Samsung Galaxy S10 since the phones are getting a lot better in recognizing faces and defocusing the background behind them. But this potential for natural-looking bokeh like the one we get from large-sensor cameras is there. We were only able to play around with a pre-release Nokia 9 PureView unit and will go into further testing once we get a retail-ready unit. As we said, depth-sensing is only one aspect of the Nokia 9 PureView's potential. The pre-production samples we saw a few days ago promise a wide range of possibilities from image stacking and RAW editing. At the moment the Nokia 9 PureView is unlikely to overtake the best smartphone cameras around. From our early impressions dynamic range isn't on par with the likes of the iPhone XS or the Huawei Mate 20 Pro and the Nokia 9 PureView is noticeably slower to process a photo. But we expect things to improve with time and updates. For now you can at least expect one of the best bokeh simulations around. Calling bokeh a gimmick shows that you know nothing at all about photography so this phone probably isn't for you!